Have I ever told you that I have a sweet tooth? Well, I do. So whenever I'm in Adelaide, I always pay a visit to Blackebys Sweets at the Central Market to indulge my sweet tooth with their incredible selection of traditional sweets and lollies. And my lolly of choice? Why, it's the old fashioned licorice allsort! I love the idea of wearing my favourite lolly. 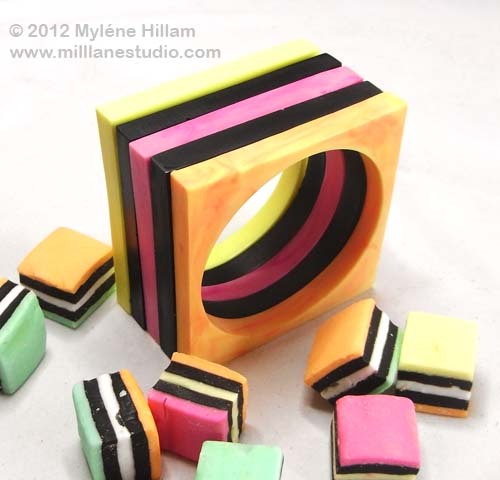 And with a much anticipated visit to Blackebys on Saturday, I was inspired to make some fun licorice allsorts bangles! 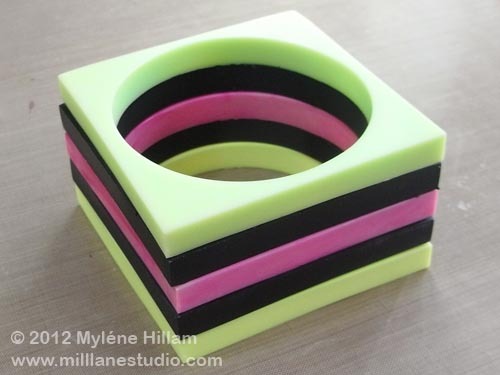 Aren't they cool - a stack of square bangles that really look like licorice allsorts. But the benefit is, you get all the colourful layers, but with none of the calories! Now I know that not everyone is a fan of licorice allsorts but if you do like them, then you know how much fun it is to peel away the layers, one by one. And in the calorie free version, you can do that too; just switch out one colour and swap it for another - such a fun accessory to add to your wardrobe! Want to learn how to make your own? 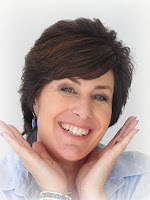 Join me in a Resin Bangle and Ring workshop in my studio and I'll show you how.